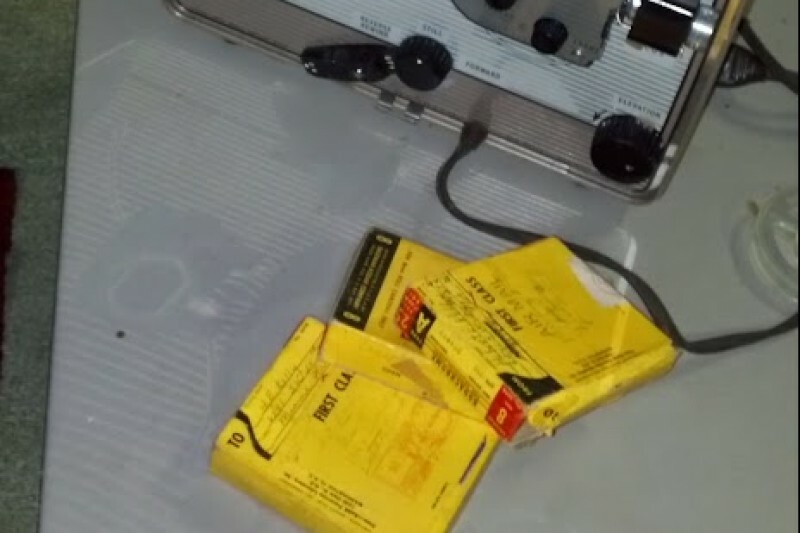 Once upon a time, my aunt sent me 71 rolls of 8mm film from my mother's family from when they were kids. It was 20 years of family history - what a treasure! Aaaaand... on a completely inaccessible media type. Doh! Being the do it yourselfer that I am, I toyed around with learning how to correctly lubricate, clean and record film to a more accessible media type. I bought an 8mm film projector on craigslist, bought a splicer and all of the stuff I needed... and here's my magic tip for converting 8mm film to digital format : hire a professional. Those family films are gold. They are people and events and lives that are 50 or 60 years past. Many of the people in them have passed or have long forgotten what's there. Although here are many accessible techniques online for maintaining film, without having had some practice, it is easy to screw up. Without experience, you won't necessarily know how to counter what you find when you start rolling a film. What if it cracks? And although I am a diy pro and feel pretty confident I could figure it out with enough time, I don't want it to be at the expense of 20 years of family history. So take the $200 it would take to buy all the stuff and stash it in a high interest savings account to hire someone and move on to picking someone out. When you're looking for a professional, look for someone who will move it to a master tape and then make a DVD for you. The tape they put it on can always be used to create more DVDs or copies later. At least until one day, it's also inaccessible. But for now, it's easier than 8mm. Check reviews for the person you select. Make sure their price includes repairs or cleaning should the film break down in the process. It's worth noting here, that film conversion is usually quoted by the foot. When estimating the number of feet of film you have, on the thicker (wider) 8mm film, although it says 25 feet on the box, it's actually 50 feet of filmed images. So, when pricing out conversion, make sure to do it with how many feet of images there are, not how many feet of film the box says it has. That got me. I was expecting to spend $300 and the bill was $600. $600 isn't something I have lying around. So, I created a crowd funding project for my family to pitch in. Within a few months, we had it funded. The day came and I went and dropped them off and, a couple of weeks later, they were done. I immediately sat down to watch them. Sidebar: I saw my grandfather, who I never met when he was alive. My grandparents - I saw them young and bright eyed with their first baby and watched them mature over the course of these films. I saw both sides of great grandparents, some of whom I've never seen photos of at all. Aunts and uncles I've never seen. This film is truly a treasure. I am so grateful that my grandparents were 'those parents', who filmed everything. I am so grateful to have had the opportunity, the means and the know how to watch them again and that my grandchildren and their grandchildren will hopefully have these in some form. The new issue was that although some of the film boxes had been labeled or had a post mark date on them and I could sort of put them in the right order for him, most of them were not. Without playing them, I had no idea what was on some of them. So although I labeled them and cataloged them before I dropped them off, when they were put onto tape and then DVD, they, of course, were not in the correct order. I wanted to present my family with something they could watch from beginning to end or something my grand-kids (in 20 years, son) could watch and understand how it was moving through time. So, the next step was to figure out how to edit the video well enough to chop up the film, put it into the correct order and then re-create the DVDs in the correct order - with some additional menus and bells and whistles so that they were easier to watch. I made lots of mistakes. It turns out, there is some skill involved in film making. Who knew?! I had to redo it 4 times. This post is the final solution for getting family films from DVD, cutting them up, re-ordering them and burning them to DVD again - without dropping ton of cash. It takes relatively advanced computer skills and I don't think I explain it very completely, in large part because I probably don't entirely understand the whys behind a lot of it. 1) First, you want to play your DVD and find the start and end points for each of the 8mm film. I recorded them in a spreadsheet along with a description of what is on each one (and what was written on the box for that film, if anything). 2) Next, rip the DVD to your hard drive. Any app will do. You want a direct copy, uncompressed. I ripped to MKV format. Your file should be 2G ish. The max capacity of a DVD is 2G. If your file is smaller than that, either your DVD was not full (you can check that in file explorer) or your app is compressing it int he process of ripping it. 3) A) My goal software was Lightworks. Lightworks is a full featured video editing suite that is relatively drag and drop and easy to figure out. But it's a beast to get video into. It only takes video in certain formats, using specific codecs. So, to get it into a format that Lightworks will accept, you have to use a piece of software to re-render the video from whatever format you ripped it into into a shiny new video file. 3) B) You can't use any old piece of software to convert it. Every time your video is compressed or made smaller, it loses quality. In order for the film to be put on DVD to begin with, it had to be compressed. If you rip it and then convert it and compress it in the process (most software will compress it), you will lose more quality. So, what you're looking for is called "Lossless Conversion". I'm sure there is a fancier technical term for it but that term paired with my google-fu landed me on the app I needed. I used Avidemux. Avidemux is free and pretty easy to use (or at least it's remedial features are. I didn't poke into the more advanced stuff). You open your file that you ripped from the DVD in it, and on the left hand side, you select your options. Then you save your file to a new name and it will save your file in the new format. But it couldn't be that easy. Nay. 3) C) Because Lightworks (your goal editing software) is such a beast, the options you use have to be really specific. I found them here. So, in Avidemux, on the left, the encoding video option to choose in Avidemux (the top drop down on the left) is MPEG 4 AVC, the audio one (the next drop down down) is AAC (I used AAC(Faac) but my film doesn't have sound) and the container (output format) is MP4 (I used MP4 Muxer). Then you click save. It took my computer about 45 minutes to finish. Your mileage will vary depending upon how much memory and processor juice you have. Once it's done, you have a high quality video file that you can open in Lightworks. 4) Although later, you will need the paid version (they offer a reasonably priced 1 month paid version that is perfect for occasional or one time use), until you need it, get a free license to Lightworks. It has limitations, but none that will stop you until the end of your project. It took me about 10 hours every time I did the steps that follow. Getting 10 contiguous hours is a rare treat in my world so it wound up taking several months to finish it. I waited until the very end to buy the 1 month paid license to Lightworks and it suited me well. 5) Create a new project with 'auto' in framerate. You can put a specific framerate if you know it. 6) Mouse over your tool bar on the left hand side of your screen till you find 'import. Click it and select your source film. 7) Mouse over your tool bar on the left hand side of your screen till you find 'create a new edit'. Click it. It will create a 'blank film'. This is your destination. When it opens, on the right hand side of it's view window, click the icon to show timeline. Drag this to the very bottom of your screen and make it as big as you can. The timeline is what you'll use most. 8) If your project browser is not up, in the left hand tool bar, click 'browse your project' and you will get a window that lists everything involved in this project, including the source film you imported. Double click your source film to open it. When it opens, on the right hand side of it's view window, click the icon to show timeline. Drag this down a bit - just above your edit timeline. 9) Click on your source video view screen and click play. You'll see the red bar start to move long the timeline. Click that red line, hold down your mouse button and drag it to the starting place for the clip you want to copy. 10) Click 'in'. This will put a blue marker on the timeline. 11) Drag the red line to the ending place where the clip you want ends. Click 'out'. this will place a blue marker. 12) Click on the colored area between the two blue markers and drag down to your edit.Drop it in your edit where you want it. If you don't click almost exactly in the middle, it will not drag properly. Repeat steps 9-12 for as many clips as you want in your edit. I had about 35 8mm clips per dvd. 13) Once you have your edit exactly how you want it, pay for the 1 month license to lightworks. Once you have the license installed, you will have the export to DVD option. Right click the title bar for the edit and select 'export'. Choose DVD. Choose the resolution. Let it export. This will take a few minutes. 14) Open the file in the software you will use to create chapters and/or burn the disk. I used ConvertXToDVD. It offers a 7 day free trial with unlimited functionality, which was perfect for my one time use. It allows you to create top menus, chapters - the things you'd want from a playable DVD - and then compresses your file to burn to DVD. This compression does cause quality loss. It's really important that up until now you have used the highest quality video you can use so that the output is still good quality. Add your chapters, menus ect. Then burn it.